During last Monday's presentation on the economy for the Orange County BIA, Chris Thornberg noted something about incentives that I had also seen echoed in an article for Fast Company magazine -- namely, that they often backfire when people only think about short-term goals. Years ago, AT&T executives tried to encourage productivity by paying programmers based on the number of lines of code they produced. The result: programs of Proustian length. To be fair, there are some contexts where one variable dominates. If you're employing a field sales rep who is selling a simple, self-contained product, then it probably makes sense to tie incentives to the sale. If you're traveling a long, straight road, the jet engine will get you there faster. New-home construction plunged to an all-time low in December, capping the worst year for builders on records dating back to 1959. For all of last year, the number of housing units that builders broke ground on totaled just over 904,000, also a record low. That marked a huge 33.3 percent drop from the 1.355 million housing units started in 2007. The previous low was set in 1991. Renters: neighborhood contagion, or a lifeline to beleaguered homeowners? In growing numbers of American towns and subdivisions, that question has become anything but academic, as homeowners associations abruptly ban rentals. Blame it on the huge slump in the housing market. For owners who have to move or who own houses as investment properties, short-term rentals can bring in some cash and keep them from having to sell at a big loss. MORTGAGE volume may have fallen last year, but not incidences of fraud. In fact, according to a recent report from the Mortgage Asset Research Institute in Reston, Va., occurrences of fraud among loan officers, brokers and other industry professionals actually outpaced 2007 levels by 45 percent in the second quarter of 2008, the most recent reporting period. The Research Institute, a consulting firm, does not release specific figures, which it compiles from surveys of lenders that make most of the nation’s mortgages each year. The report, released in early December, found that 36 percent of the fraudulent mortgage activity involved loan professionals’ misrepresenting borrowers’ incomes, while another 20 percent involved misrepresentations of borrowers’ employment. Lenders did not specify how much of this activity was simply stretching of the truth by loan professionals on the applications, categorized as “fraud for property,” as opposed to “fraud for profit” schemes, in which bogus loans are taken out to defraud lenders of money. Fraud for property is far more common. Want to know the future of Orange County and the U.S. economy? There's still time to sign up for the 2009 Economic Outlook produced by the Orange County BIA Chapter on January 26th at the Irvine Marriott. Presenters will include Christopher Thornberg and Brad Kemp from Beacon Economics, with perhaps a small intro I've give explaining on why these guys should be on the speed call list for builders and developers. Since this is the most-attended event for the OC BIA, they're offering 90 minutes of 'extended' networking, so bring your business cards! My column for the January issue of Builder & Developer magazine is now online. From the 1940s until very recently, U.S. housing policy consisted of two words: more homeowners. Everything from highway construction to taxation revolved around that goal. And the results were spectacular, as ownership rates went from 62.1 percent in 1960 to a peak of 69 percent in 2004. Equally spectacular—but with dire consequences—was how the “American Dream” mutated into “America’s Piggybank” and then “America’s Nightmare” within the last decade. Describing California's monumental budget deficit as "a rock upon our chest," Gov. Arnold Schwarzenegger broke from tradition in his State of the State address today with a blunt vow not to advance any policy agenda this year other than resolving the state's fiscal crisis. "Addressing this emergency is the first and greatest thing we can do for the people," Schwarzenegger said. "The $42-billion deficit is a rock upon our chest, that we cannot breathe until we get it off. It doesn't make any sense to talk . . . about education, infrastructure, water, healthcare reform and all those things when we have this huge budget deficit." Considering the amount of overbuilding that took place in California during the boom, some type of decline was necessary in order to bring supply and demand back into balance. The latest update on California building permits shows just how drastic that decline has been. Click for entire post here. Many thanks to Christopher Thornberg at Beacon Economics for suggesting me to the Journal. He will also be a regular (if occasional) contributor on economic trends related to real estate, so be sure to look for his posts. Have any ideas on posts you'd like to see? Email me suggestions at info@metrointel.com. The 2009 International Builders Show is just days away (January 20-23 in Las Vegas). The Web site for Builder magazine has some interesting stories for any one planning to attend the show, as summarized below. I will be attending this year on Tuesday, Wednesday and Thursday to cover the show for Builder & Developer magazine, so if you see me please feel free to introduce yourself and say hello. The Southern Nevada Green Building Partnership might be a catalyst for reviving the Las Vegas market. Two very different show homes for the 2009 International Builders' Show in Las Vegas. IBS '09 offers 250 educational programs during show week. These caught our attention. The exhibit floor is sure to be chock-full of good ideas. Here are a few to look out for. The IBS will offer an orientation to first-time attendees and an a la carte fee structure to attract builders to the show. The NAHB follows up last year's successful launch of green building initiatives will a full slate of activities in 2009. Lou Holtz headlines the show as this year's keynote speaker. Economists believe the recession is likely to get worse until the spiraling job losses and unemployment rate start to improve. Record low mortgage rates won't lead to higher home values and increased home sales as long as 500,000 people a month are losing their jobs. Rising unemployment will probably make banks even less willing to lend and also lead to increased defaults on a large range of existing loans. 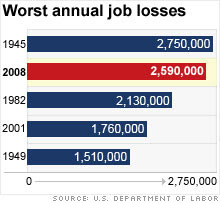 And with more consumers losing, or worried about losing, their jobs, that should lead to a further pullback in spending. In turn, that will make it tougher for companies to increase their profits, which could lead to even more stock market losses. Even the people who have jobs are suffering. According to a recent survey by the Society for Human Resource Management, more companies are reporting that they are cutting pay of their employees in response to the difficult environment. In addition, the average work week has been falling steadily during the past four months. A record 8 million workers that want full-time employment have only been able to get part-time jobs, according to the government's December labor report. That's up 37% from the total of so-called underemployed workers in August. Pay hikes will be at best modest this year for many employees lucky enough to get increases. A survey by consultant Hewitt Associates found raises will be less than 3% for the first time in the study's 32-year history. Two months after Treasury Secretary Henry Paulson pulled the plug on his plan to buy troubled mortgage assets, the financial industry is pushing the government to reconsider. Since the Troubled Asset Relief Program, or TARP, took effect in October, Treasury has spent $267 billion buying preferred stock in financial institutions and auto companies, the agency said Thursday. Paulson has said the capital infusions have stabilized the financial sector. But the economy has taken a sharp turn for the worse in recent months, as credit has become less available and companies and consumers have cut back on their spending. Meanwhile, U.S. banks continue to hold hundreds of billions of dollars of mortgage-backed securities that, if downgraded, could lead to another round of damaging writedowns. Although rents in many places of Southern California started falling at least 12 months ago, it's been more recently that the declines have shown up in multiple markets throughout the U.S. Bad news for flippers hoping to earn cash flow until the market rebounds, but generally good news for potential renters. Some advice for landlords: if you keep your rents slightly under the market and resist the urge to push them up as high as possible, you'll keep your tenants longer, which will more than even out for vacancies you'll suffer over the long run. U.S. apartment rents fell in the fourth quarter from the third as the national vacancy rate climbed to a four-year high of 6.6 percent, Reis Inc. said. Job losses and lower wages are cutting into the pool of potential renters in their twenties and thirties, defying the expectation that apartments would benefit from the housing slump, the New York-based research firm said. Los Angeles apartment rents fell 0.7% in the fourth quarter, the first decline since 2001, although overall rents for the year were up slightly over 2007. Property owners and real estate agents say the supply of rental units has climbed in the last year. Overbuilding during the real estate boom added vacant units to the rental pool, and some home sellers discouraged by the moribund real estate market are renting their houses or condominium units rather than trying to sell. Foreclosures add both supply and demand to the rental market, as foreclosed homes become rentals and former owners seek places to rent. Declining incomes and rising unemployment also mean people have less to spend on rent. Mark Verge, owner of the property listings service Westside Rentals, said he'd seen rents fall faster in the last three months than at any time since he founded the company 13 years ago. "I used to have to beg owners to lower rents. Now they ask me, 'What do you think I should lower it to?' " Verge said. Verge said his service had 24,000 units listed for rent -- a 33% increase from the 18,000 he had at this time last year. It may take landlords awhile to catch on, but rising vacancies should result in lower apartment rents in 2009, a local Grubb & Ellis Co. manager says. Grubb & Ellis, a Santa Ana-based national commercial brokerage, issued its 2009 outlook saying that Orange County is the third-best multi-family market to invest in out of 56 U.S. apartment markets. But Kurt Strasmann, Grubb’s regional managing director in Newport Beach, said the high ranking is due more to Orange County’s “long-term fundamentals” (good job growth, diverse economy, etc.) rather than prospects for landlords in the coming year. The pool of renters is increasing because foreclosures have forced more homeowners into apartments and because many would-be homebuyers are waiting for home prices to fall further. There’s also been an increase in supply as more houses and condos that don’t sell are leased out. Many new college grads unable to find work are doubling up with room-mates or moving back home, decreasing the pool. Some of you may remember the recall of former California Governor Gray Davis in 2003, soon to be replaced by grunting action start Arnold Schwarzenegger, who swept into office promising reform and conservative ideals. Davis was booted out of office mostly for being blamed for huge spikes in electricity rates -- when energy traders held the state hostage -- but he had also overseen an increase in state spending beyond growth in population and inflation during his term and was viewed as ineffectual. A friend of mine was a top adviser to Davis at the time, and told me that Davis' biggest flaw was not standing up to his critics and fully explaining his decisions. When Schwarzenegger visited my friend's office and declared it a "perfect place for a (cigar) humidor," he knew things were going to be quite different moving forward. So were Californians simply (a) unrealistic; (b) immature; (c) clueless or (d) silly to swoon over a well-meaning and likable Schwarzenegger, or were the state's future fiscal crises simply inevitable? Next, a big reason for the state's quandary is the way in which it creates its annual budget. That's why a group called California Forward is working to institute changes in the budget process. Led by co-chairs Thomas McKernan (CEO of the Auto Club) and Leon Panetta (the former Congressman and Clinton White House Chief of Staff whom President-elect Obama has tapped to head the CIA), they recently commissioned Beacon Economics to produce a report on what lies ahead for the state given reduced income due to the housing bust and the recession. You can find the intro letter signed by McKernan and Panetta here. You can find the entire report by Beacon Economics here. If you're a California resident, I urge you to read this report -- and then contact your local State Senate and State Assembly representatives for your input. No other bank has broken ranks with the industry on the proposed bill. Mr. Durbin said he hoped the move by Citigroup, should other banks and financial trade associations take the same stance, would lead to backing by enough Democrats and moderate Republicans to push the bill through. After retreating in fear from housing's sudden collapse, those who buy homes as an investment are reappearing in Inland Southern California's beaten down marketplace. The process of "flipping" is still risky, many experts warn, since the investor has to take into account that home values continue to fall, which could erode anticipated profits from a resale.. Brokers say most prospective investors, many of whom were burned by waiting too long to sell properties before prices plummeted, still remain timidly on the sidelines. Mike Novak-Smith, a broker-agent with Re/Max Results in Moreno Valley who specializes in selling repossessed houses, said since the summer he has seen an influx of investors, who he said now account for about 30 percent of his buyers. He said most seem to be novices, while the more seasoned are waiting for prices to fall further. The rekindling of investor interest is bad news to some people who blame investors for having fueled the recently burst real estate bubble. Not everyone agrees that investors perform a public service. John Marcell, an Upland mortgage broker, said the FHA will lend up to $35,000 to first-time buyers for repairs or improvements. He said he worries that investors will again inflate home prices by flipping. Marcell also said that investors who buy houses for income and future appreciation will contribute to an oversupply of rentals. Prudential California Realty agent Marni Jimenez said in competition for houses, investors generally have an edge over first-time buyers. She said that is because investors come with a substantial down payment. Investors also tend to have conventional financing that lenders prefer over the FHA mortgages that are geared for entry level buyers that take longer to arrange. Inland economist John Husing said investors who are buying bank-owned houses for rental income further deteriorate neighborhoods and attract crime. "It is a great strategy for the investor but a disastrous strategy for the community," Husing said. Having walked through model home complexes during the boom years when sales agents would attempt to explain sub-prime and Option ARM loans to Hispanic buyers who didn't seem to fully understand the ramifications of their signatures, I'm sure the procedure at the lender's office went something like this: "Just sign here. We'll fill out everything for you. Housing always goes up. Have a nice day!" For years, immigrants to the U.S. have viewed buying a home as the ultimate benchmark of success. Between 2000 and 2007, as the Hispanic population increased, Hispanic homeownership grew even faster, increasing by 47%, to 6.1 million from 4.1 million, according to the U.S. Census Bureau. Over that same period, homeownership nationally grew by 8%. In 2005 alone, mortgages to Hispanics jumped by 29%, with expensive nonprime mortgages soaring 169%, according to the Federal Financial Institutions Examination Council. When the national housing market began unraveling, so did the fortunes of many of the new homeowners. National foreclosure statistics don't break out data by ethnicity or race. But there is evidence that Hispanic borrowers have been hard hit. In part, that's because of large Hispanic populations in areas where the housing bubble was pronounced, such as Southern California, Nevada and Florida. ...a close look at the network of organizations pushing for increased mortgage lending reveals a more complicated picture...Lawmakers and advocacy groups pushed hard for the easy credit that fueled the subprime phenomenon among Latinos. Members of the Congressional Hispanic Caucus, who received donations from the lending industry and saw their constituents moving into new homes, pushed for eased lending standards, which led to problems. Mortgage brokers became a key portion of the lending pipeline. Phi Nguygn, a former broker, worked at two suburban Washington-area firms that employed hundreds of loan originators, most of them Latino. Countrywide and other subprime lenders sent account representatives to brokerage offices frequently, he says. Countrywide didn't respond to calls requesting comment. Representatives of subprime lenders passed on "little tricks of the trade" to get borrowers qualified, he says, such as adding a borrower's name to a relative's bank account, an illegal maneuver. Mr. Nguygn says he's now volunteering time to help borrowers facing foreclosure negotiate with banks. These days, James Scruggs of Northern Virginia Legal Services is swamped with Latino borrowers facing foreclosure. "We see loan applications that are complete fabrications," he says. Typically, he says, everything was marketed to borrowers in Spanish, right up until the closing, which was conducted in English. Before the 1930s all economic downturns were commonly called depressions. The term “recession” was coined later to avoid stirring up nasty memories. Even before the Great Depression, downturns were typically much deeper and longer than they are today (see right-hand chart). One reason why recessions have become milder is higher government spending. In recessions governments, unlike firms, do not slash spending and jobs, so they help to stabilise the economy; and income taxes automatically fall and unemployment benefits rise, helping to support incomes. Another reason is that in the late 19th and early 20th centuries, when countries were on the gold standard, the money supply usually shrank during recessions, exacerbating the downturn. Waves of bank failures also often made things worse. Where does that leave us today? America’s GDP may have fallen by an annualised 6% in the fourth quarter of 2008, but most economists dismiss the likelihood of a 1930s-style depression or a repeat of Japan in the 1990s, because policymakers are unlikely to repeat the mistakes of the past. In the Great Depression, the Fed let hundreds of banks fail and the money supply shrink by one-third, while the government tried to balance its budget by cutting spending and raising taxes. America’s monetary and fiscal easing this time has been more aggressive than Japan’s in the 1990s. However, these reassurances come from many of the same economists who said that a nationwide fall in American house prices was impossible and that financial innovation had made the financial system more resilient. Hopefully, they will be right this time. But this crisis was caused by the largest asset-price and credit bubble in history—even bigger than that in Japan in the late 1980s or America in the late 1920s. Policymakers will not make the same mistakes as in the 1930s, but they may make new ones.